Nuestra Señora del Pilar (Our Lady of the Pillar) or locally known as Nana Pilar is the patroness of the city and of the diocese. The religious celebration was held every 12th day of October. Part of the celebration is the traditional dance procession called “Karakol.” It is a way of thanksgiving for the blessings received and requested for the continued provision of daily needs by the people. 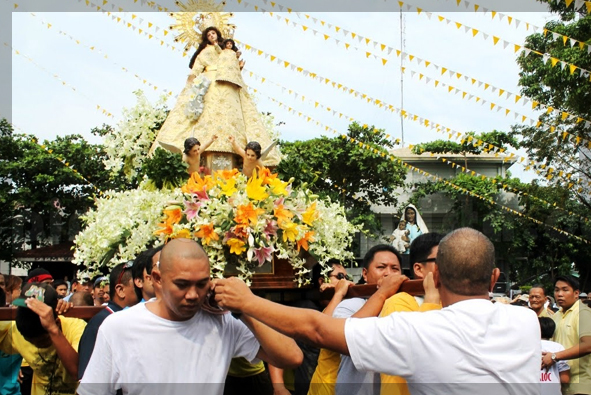 In the Karakol, devotees will carry Nana Pilar around town while dancing in folk music. This procession will commence and conclude in the Imus Cathedral. The Imus Cathedral (Katedral ng Imus) is the home of Nuestra Señora del Pilar. It was founded in 1795 as a Parochial Church by the Augustinian Recollect priests. The church was declared a Cathedral and the Seat of the Diocese of Imus on November 26, 1961. The cathedral is an exponent of old Hispanic Architecture and exudes an ambiance conducive to monastic life and spiritual meditation. The arches and walls of the place are made up of red colored bricks and the arches of the church are accentuated by Latin inscriptions.